A simple yet elegant gift, the Mangia Gift Collection from DeLallo will be the perfect Christmas gift for your co-workers! This gift is perfect for snacking! With all the essentials of an antipasto platter, this gift is ready to be enjoyed! Whoever opens this present will be snacking on all the goodies before the rest of the presents are even opened. Give someone a taste of traditional, authentic Italian cuisine in the form of antipasto, ready to form perfect bites of savory, gourmet flavors straight from Italy. Because it is not too much, it is the perfect gift for your friends at work, colleagues, and co-workers. Order this DeLallo gift collection for your officemate, cubicle neighbor, supervisor, or even a client. It is elegant, professional, and delicious! 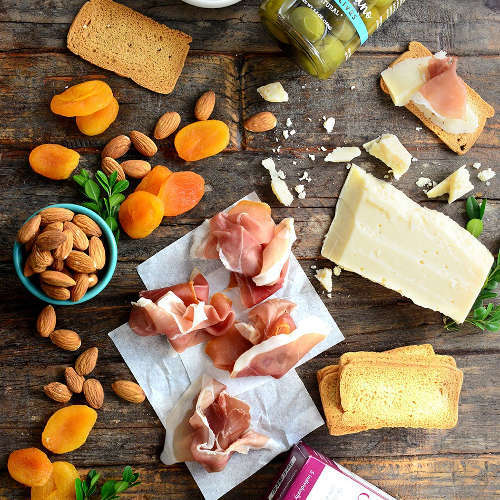 Foodies will fawn over the mouth-watering asiago cheese, prosciutto, toasty crostini, salty castelvetrano olives, nutty raw almonds, and sweet yet tart dried apricots. Your friends and colleagues that aren’t very skilled in the kitchen will appreciate the ready-to-eat pairings and will fall in love with the flavors. 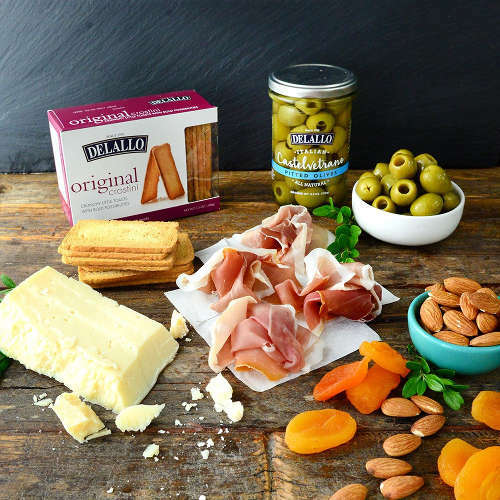 Wonderful for bachelors or those who live alone, the Mangia Gift Collection from DeLallo is the perfect amount for single snacking. You could share with another person, but why would you want to? Order one for yourself, and one for your officemates today! Sliced Prosciutto Pack – 5 oz. Pitted Castelvetrano Olives – 10.6 oz. Crostini Original – 3.5 oz. Asiago Cheese Wedge – 8 oz. Raw Almonds – 5 oz.